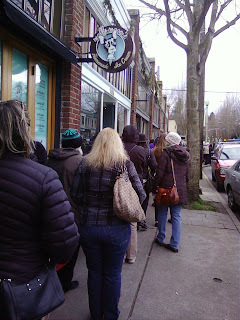 Saturday I stood in line for two hours to get into the Glassy Baby Store for their annual Seconds Sale. I didn't think I would be in line for so long...but once I was there for an hour and a half I couldn't just leave. After two hours in line I finally got in. It was so crowded in there you literally could not move...wall to wall people. In 5 minutes I found what I wanted, paid and got out of there! Later a friend told me her niece came down from Bellingham to go to the sale. She was there by 4:45 am and was 4th in line! The sale didn't even start until 9:00 am. So she waited over 4 hours! I didn't have my sketch book but I found a piece of cardboard in my purse and also had my ink pens. Here are the sketches I did while waiting in line. And a picture of the actual line as we got closer to the store. I like your use of color. Did you use pastels? Inspired by some glassy baby colors, perhaps? Is that new paper? Creates a really interesting sketch! I was at the sale as well, not sure I'll ever do that again, too crazy! Hope you're enjoying your glassy baby.